will you be ready ?? Joe! You asking right questions. I can tell you, easiest thing in life is to find a reasons not to do it. Pessimism is more appealing to most people than optimism. In the past 30 years , all attempts to create reversible wing, had no success. People simply put spreaders between surfaces and call it wing. You can't expect positive results with thick bag on the rig. Even Americas cup catamaran have symmetrical design with flap, I call it "desperation". In early years when NACA did their research on airfoil, they conclude, that very small changes in profile lead to very different results. No wander your blog did not generate any interest, because we heard it all. I know for sure that even with my design people remain skeptical, I can't blame them for it, damage has been done. So far, till now, nobody in the world, ever, used reversible asymmetrical wing. Back to your question about weight and price. Wing with what I sail now (heaviest version) is easy to manage, I can sail 4 hour session no problem. Wing has low center of gravity , most of the weight stays on the board. Wing is modular. It has left and right surfaces, leading edge, pneumatic mechanism and under the boom camber inducer. Meaning, if you need another new sail, you don't have to buy the hole system. Things like camber inducer can be used on all wings. also pneumatics. I understand that price needs to be affordable. I look at it this way: If carbon Wilson tennis rocket with strings and graphics + store and middle man profit, could cost $50, there is something could be done to make wing affordable. I want to point, that, I built wing from the scratch, in my shop , with my hands, every single part, therefore I know what I?m talking about. I'm not sure that I will go to Heksher park in Long Island, not my favorite spot, deep water no wind. I usually sail in NJ State Park , there is very windy spot and mile chest deep water. If you want to try my sail, I can point you where and when to go, when we are ready of course. anywhere on NE USA shoreline or Lake Champlain ?? I doubt about lake, but as I said before, as soon as sail ready we will invite everyone for demo. I was wondering how you rig the wing. Do you have perhaps a short video clip of it ? Does it take long ? Is it more work than rigging e.g. a 4 camber traditional race sail ? Hey Mark! You are second person today who asking me this question. No, I don?t have video of rigging, but It is in my future intentions. Rigging wing sail is not complicated: stretch one panel on the ground, than zip one side of pneumatics, put mast on the top and hook mast top with one side, than put another panel, hook the top and zip other side of pneumatics, downhaul, than pump air in 3 separate bladders, fit camber inducing mechanism and attach it with 2 screws. Than boom, outhaul, hook mechanism with mast (aim) and zip leading edge, walk around look for adjustments, oh , each pair of battens needs to be tied on the back, at this time I tie it up with small string, not much work but it something I have to solve to make it more easy and appealing. I?m naturally fast rigger, it takes for me around 15 min to set wing, but you probably have seen people spending half day rigging traditional sail. ^^^ Pumping air into bladders may be a bridge too far for most windsurfers! Maybe, but during waterstarts they will really appreciate it. Besides, bladders are small, much smaller than kite . "So far, till now, nobody in the world, ever, used reversible asymmetrical wing"
I really like this subject and I truly believe in the potential of a double sided asymmetrical, reversible wingsail. That is because I know of a 1993 prototype, held it in my hands. Since then (2011) it has been in my mind. How awesome was that!! Now it is not up to me to tell who was the designer or where it is, but still I like to say that the sail was stunningly simple in construction, with the both sides forming an asymmetrical profile and after gybing, sail rotates and becomes asymmetrical for new tack. I haven't seen the ARC Wingsail in working order so I cannot compare it to the 1993 proto, but the '93 proto was for sure more simple in construction. If that was a mistake, intended or due to lack of testing time, I don't know. I do now is has been on the water and performed. Even if the double sided wings would become more expensive than our regular cambered sails, if they have the advantages they are said to have, 1 could maybe easily replace 2 race sails. So a more expensive sail coul still be worthwile putting in production. Also, the advantages they are said to bring us, are very interesting to all windsurfers, of any level. We all want easy sails with huge, usefull range don't we? Thank you Sergio for such a great post! I designed wing sail because I want it for myself. In the beginning idea was simple and it did perform to unlimited wind range, but it didn?t had right feel, and huge drug built up on speed 24 kt. I know now, that all wing sails designed before me, had same problem. To eliminate these defects of airfoil took 2 years. Than I complicate it and simplify it quite a few times. In reality there is no easy way to make something good. Just a little example: on my picture ?back wheel riding? battens bending slightly back, caused by too much pressure on windward side. I used cheap polltruded Chinese made tubes. Speed was 26KT max 28. After I fixed problem and went even on lighter wind, my average was 27.5 max 29.88 1 feet high chop. And there is no feeling of overpowering or any other nonsense. Also, I hate deep water, because 90% of the time I spend digging sail from under. That 90% of the trouble, wing sail reduce to 0%. 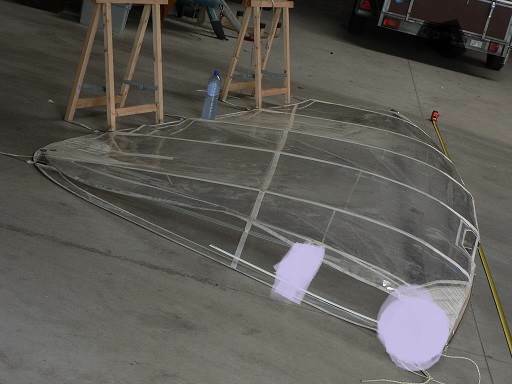 I?m sure in the feature wing sail replace all race sails from 6.5m to 3m as it did for me. Another interesting question popped up on the Dutch windsurfing forum. Because of the asymmetry of the sail you have on 1 side more sail surface than on the other side. Yet, when the sail flips after a jibe you have the reverse. I don't believe that the sail material can stretch that much. So how do you manage this ? leading edge material moving around the mast about 3 inches , compensating difference. Cool ha? ?Faced with the choice between changing one?s mind and proving that there is no need to do so, almost everyone gets busy on the proof.? Joe , I'm a little bit confused, asymmetrical wing sail for 20 years? I couldn't find any asymmetrical wing sail anywhere, pictures , patents , etc. could you provide any picture of link , so we all can see. You've got to back up your words somehow. May be you share links and pics of asymmetrical wingsail with us? Thank you for links, it was interesting. I'm delighted that my development sending ripples around the world. Thanks again. Can't remember where I read it but recall Gaastra put serious work into a wing sail then shelved it. I'm not 100% sure of this though if memory serves me I had this discussion with one of the guys involved in the design of Arrows sails, who's chief designer AKA 'WB' had been involved with Gaastra for a period. Sorry I can't be clearer than that! I've seen that image, this is not a wing sail. This is just sail with big pocket and it doesn't give much advantage. No wonder it got shelved. I've seen this before. Just from the drawing, it never going to work. I can explain if you want me to. Feel free . I'am not going to stop you . If you can find the time great . Nice work you have done . Love your workshop ! and what you make in it .